Collectively, New Zealanders love credit cards. This is the time of year when the plastic in our pocket gets a workout. According to RBNZ statistics, Kiwis collectively spent $3.07 billion on their credit cards in June 2016, which is actually the lowest monthly amount spent since September 2015. What happened? Did we not hit the winter sales with quite as much enthusiasm as usual this year? Following on from that the good news is that we also collectively owed slightly less at the end of June than we have in recent months; with approximately $6.48 billion outstanding at month end. Mind you, with a weighted average credit card interest rate of 18.1%, we wouldn’t really want to owe much more than that. With that volume of money being spent on credit each month, it makes sense for consumers to ensure that they are getting value for money. Getting good value on a credit card will depend on the type of shopper you are – do you always juggle a credit card debt, or do you pay your card off every month? Do you spend a little or a lot? Are you chasing rewards points or are you simply looking for a low annual fee? Asking yourself these type of questions will help you to work out what type of credit card you’re looking for. For shoppers who diligently pay their credit card in full each month the interest rate isn’t going to be the main concern, they won’t be paying it. Depending on the amount of money they put through their card, rewards points and other reward offers could be very enticing. Essentially it’s a way to self-gift! Otherwise, you might be looking for a card with a low annual fee. 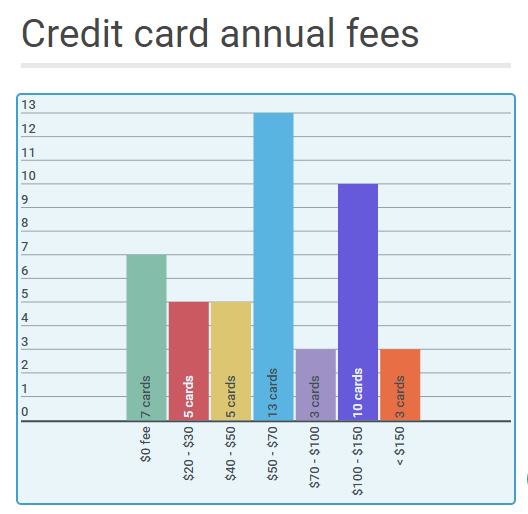 On the CANSTAR database, annual credit card fees can range from $0 up to $395. A big difference! For those who often juggle a debt and pay interest on their card, the interest rate that you are paying is likely to be a major consideration. And the good news for those consumers is that there is quite significant variability in interest rates on offer. Based on the credit cards on the Canstar database, the cheapest credit card interest rate on the database currently is 5.69% – although this rate is only available for home owners. Barring that, the next-lowest rate is 12.69%. On the other hand, the highest interest rate on our database is a hefty 25.45%.